The Danish version of the tiara had some travelling to do before it landed in Denmark. Princess Louise (1808-1870) left the tiara to her oldest daughter, also named Louise, who was Queen of Sweden and Norway. Queen Louise (1828-1871) unfortunately died shortly after inheriting the tiara and it quickly passed on to her daughter, who was also named Louise (1851-1926). This Louise married the future King Frederik VIII of Denmark in 1869, and the tiara arrived at its final home. Queen Louise of Denmark wore the tiara with a few other pearl and diamond pieces: a demi-parure of a necklace and earrings which had been a wedding present from the Khedive of Egypt, and a brooch that came from her grandmother. 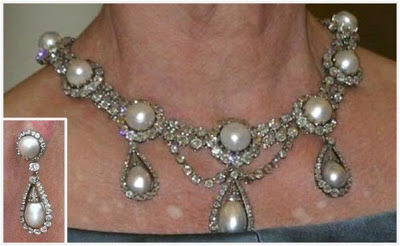 The pieces weren't designed together, but they worked so well that they became something of an assembled parure, and are still worn together today. Louise made sure that the parure stayed in Denmark: when she died in 1926, she left it to the Danish Royal Property Trust, which ensures that the pieces are not the personal property of any particular royal, so they will pass from monarch to monarch without being sold. 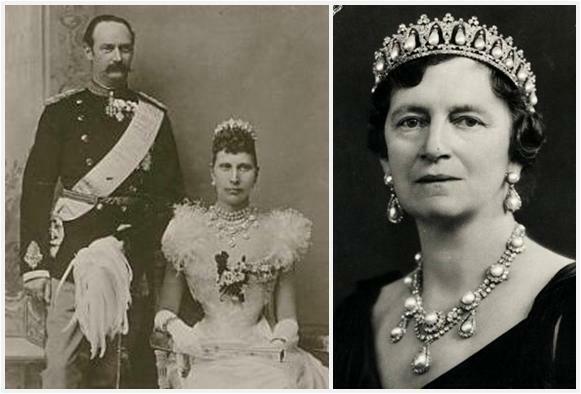 And so the parure has been worn by Louise's daughter-in-law Queen Alexandrine (1879-1952); Alexandrine's daughter-in-law Queen Ingrid (1910-2000); and Ingrid's daughter Queen Margrethe, who wears them today. This tiara, along with the Danish Emerald Parure, makes frequent appearances at the annual New Year's Court gala, one of the most important and formal occasions of the year; Margrethe has also worn it to big events like her own jubilee celebrations and Crown Princess Victoria's wedding, as well as plenty of well-known portraits. She's not prone to a tremendous amount of tiara loaning in the first place, but this is one of the pieces that has historically been kept for the queen (exceptions were notably made for two British coronations: Ingrid, while still Crown Princess, at the 1937 coronation of George VI and Elizabeth, and Princess Margaretha at the 1953 coronation of Elizabeth II). Margrethe makes good use of it, though, and it nestles well into her signature updo. The Pearl Poiré Tiara is part of a prominent subset of pearl tiaras: the pearl drop tiaras, which take advantage of a natural drop shape and dangle those pearls from diamond frameworks. Its companions include the Grand Duchess Vladimir Tiara, the Cambridge Lover's Knot Tiara, and the Cartier Pearl Drop Tiara from Monaco. Is this your favorite pearl drop tiara?